In a previous post I wrote about the sad demise of my inexpensive printer, the HP OfficeJet 4300. After several years of service, it stopped working after I inadvertently dropped it from a tall height, from the printer's perspective. In the course of shopping for a new printer, I spoke with a salesman who reminded me that the true cost of the printer is not the physical device itself but the ink cartridges. Both laserjet and inkjet printers require cartridges of ink in order to print. Some printers require cartridges with three colors together (cyan, magenta, and yellow) and a separate one for black. Other printers provide slots for each individual color used in the printing process. This provide some economy as colors with ink remaining don't have to be discarded as is the case with the 3-color variety. My discussion with the salesman reminded me of an exercise I conducted as the introduction to a data analysis workshop. The task is simple: put a series of liquids in order from most expensive to least expensive. Before proceeding, take a few minutes to do this activity. From the perspective of data analysis, there are several steps required to accomplish this seemingly simple task. 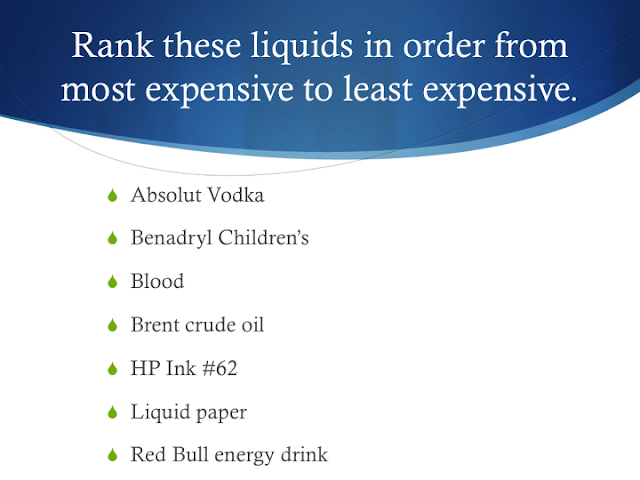 You must set aside any assumptions about what you believe the costs of each liquid. Since all of the liquids are packaged differently, a common denominator must be determined. For this exercise, converting every liquid into milliliters seems like the best common measurement. The costs for each package must be estimated. This is easier to accomplish using small groups of people, as at least someone may be able to approximate the cost of a particular liquid. From this point, the calculation of price per milliliter is fairly straightforward. The result is displayed in the following table. 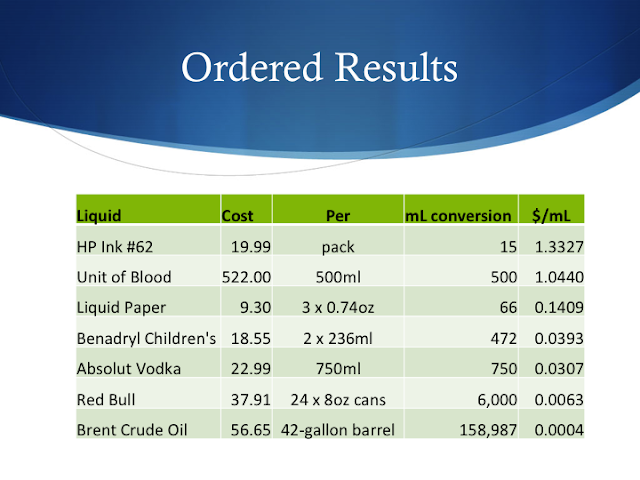 Most of the prices are from Amazon.com where possible, and the Internet when products (e.g., blood, crude oil) are not available in a retail setting. As you might have already guessed - given the discussion about ink - inkjet ink is far more expensive than other essential fluids. This is especially useful to consider when evaluating new printers. 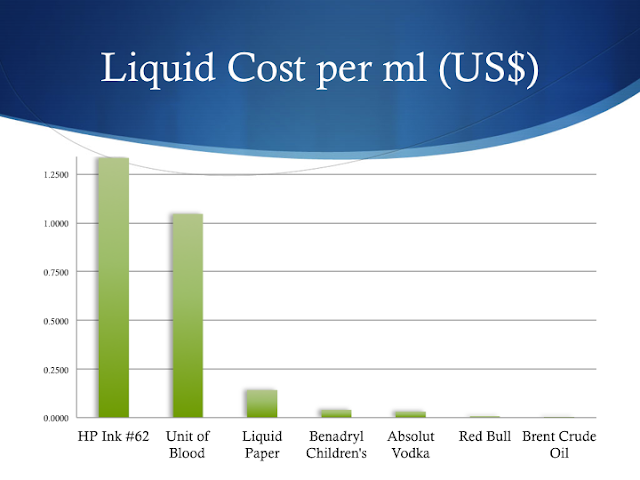 Using a printer that economizes ink use can result in significant savings over the lifetime of the printer.